With a freezer brimming with Sockeyes and Coho, entering September we have salmon security for the coming winter. The Coho have been particularly fun to put away. These silvery bright ocean-fresh eight to 12 pound fish often hit our lures right at our feet as we cast, swing and retrieve through the Chignik River’s clear green water. We caught and filleted the last fish we need Friday evening just before two straight days of gale force winds lashed our village with heavy rain and turned our lake into an angry, white-capped sea. Today was a good day to stay inside. While José González played quietly in the background on our Bose speaker, Barbra bottled a couple of cases of beer – a red ale and an amber – and turned out two handsome loaves of her famously delicious sourdough bread. I cured a couple of skeins of salmon eggs and tucked in with David McCullough’s fascinating Pulitzer Prize winning biography, John Adams. A few days ago, a friend presented us with halibut and alder-smoked Sockeye salmon. Today was the perfect day to thaw the halibut and put these gifts to use. The secret to this recipe is to cook the potatoes and the vegetables separately and to then put the chowder together. Roasting the potatoes adds to the depth of flavor and texture. When cutting ingredients up, you want pieces small enough so that more than one item can fit on a soup spoon, but big enough to carry flavor. Celery and bell pepper can be strongly flavored, so cut these finer and go easy on the amount of each. Precooking will significantly soften and sweeten the flavor of these vegetables. Place the diced potatoes into a bowl. Toss with olive oil and smoked sea salt. Roast the potatoes till soft and beginning to brown and crisp – about 10 minutes. Remove from heat. Meanwhile, heat some butter in a large pan. Add the bell pepper and some sherry and cook for about 2 minutes. Then add the celery, leeks and sweet corn. Add smoked sea salt, and perhaps a little more sherry, to taste, stirring occasionally. When the vegetables have just cooked through and become soft, add the tarragon, oregano, nutmeg and black pepper, tasting as you go. Toss together thoroughly and remove from heat. Add the potatoes and the cooked vegetables to a large pot making sure to scrape out all the butter & sherry mixture from the vegetable pan. Add the halibut and salmon and toss everything together well. Add enough milk and cream in about a 4 to 1 ratio to sufficiently cover all the ingredients. Add additional salt as needed. Heat on high heat just until the chowder is steaming and the halibut is cooked through. Don’t boil and don’t overcook. Serve piping hot with sour dough bread and butter. Let the weather do its worst. Anyone who knows Jack knows that he is a fisherman through and through. Moving to a village where the salmon are running so thick we can see them finning up the river and into the lake is beyond Jack’s wildest expectations. This is not his dream. This is our reality. He’s spent time every day walking the shore, sometimes with fishing rod in hand, other times just watching and listening to the music of river current and salmon jumping, splashing, sloshing their way upstream. And so it’s understandable that it was left to me to spot the patch of raspberries Jack had walked right past on his way to the river. And such raspberries! The patch isn’t large, but this has been an exceptional year for berries and the vines are heavy with tart, sweet, jem-like fruit. And with green berries still growing in more shaded parts of the patch, we should be able to pick all we need. Jam, pies, syrups, fresh with morning cereal… How about a raspberry-chipotle sauce to go with fresh-caught salmon? “Bigger than store-bought,” as Jack says. Tastier, too. I don’t know about them being as big as your thumb, but they’re the biggest we’ve ever seen. Can you believe he was so intent on the salmon that he walked right past the whole patch without even noticing?! 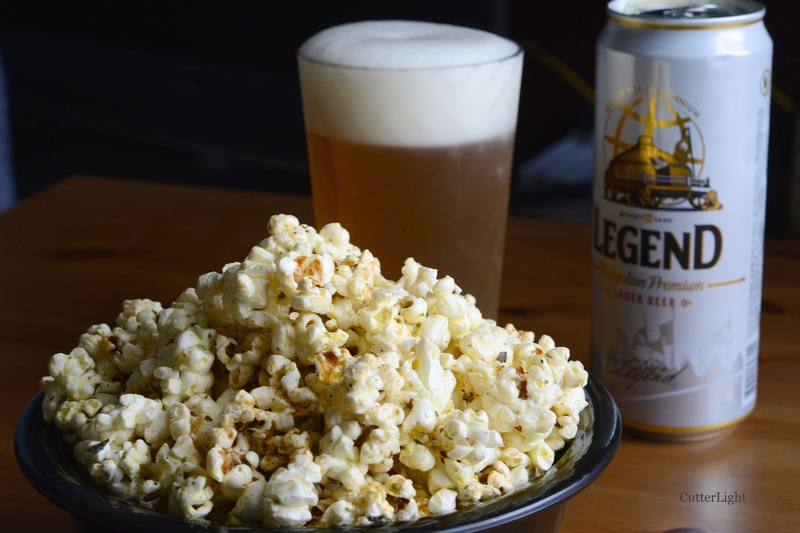 Savory stovetop popcorn, a favorite lager and your main squeeze. All that’s needed now is the movie. 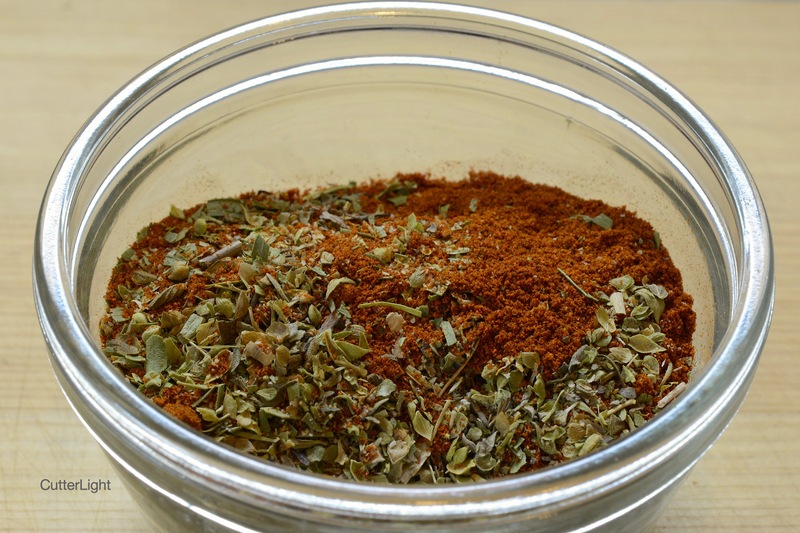 Start by mixing together a savory blend of herbs and spices. No need for an air popper or countertop gadget. 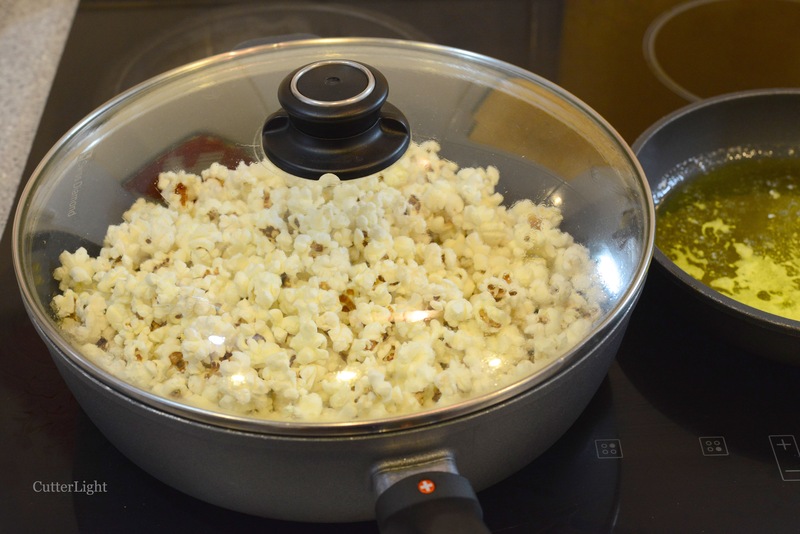 Excellent popcorn can be made right on your stovetop. Start with 1/3 cup popcorn. Set three kernels aside. These will go into your pan first. Place 2 tablespoons olive oil (or other oil) into a pan such as the one pictured below. Add the three test kernels and heat over medium heat. (Use three in case one or two are duds.) 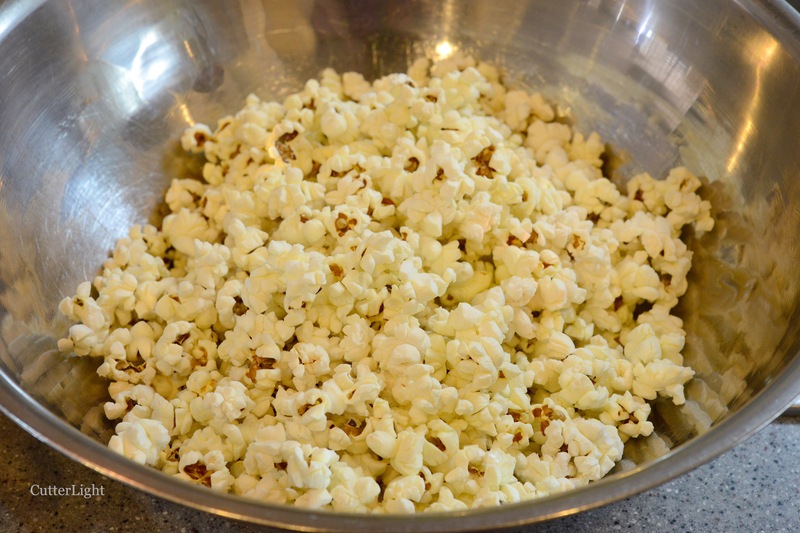 When one of the test kernels pops, remove it, and add the rest of the popcorn. A pan with a clear lid is helpful, but not necessary. Gently shake the pan occasionally. 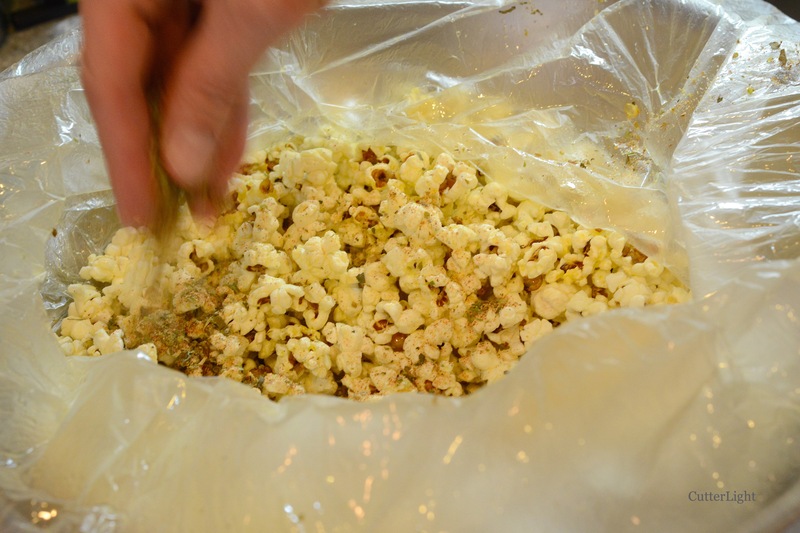 While preparing the popcorn, melt about 1/3 cup of butter in a separate pan. When the butter is melted, remove from heat, but keep it warm. Place the popped popcorn in a bowl. This will allow it to slightly cool which will prevent the hot seeds from causing the plastic bag to melt. If you’ll be making additional batches of popcorn, place the bowl in a warm oven of around 100 degrees Fahrenheit (40 degrees Celsius). 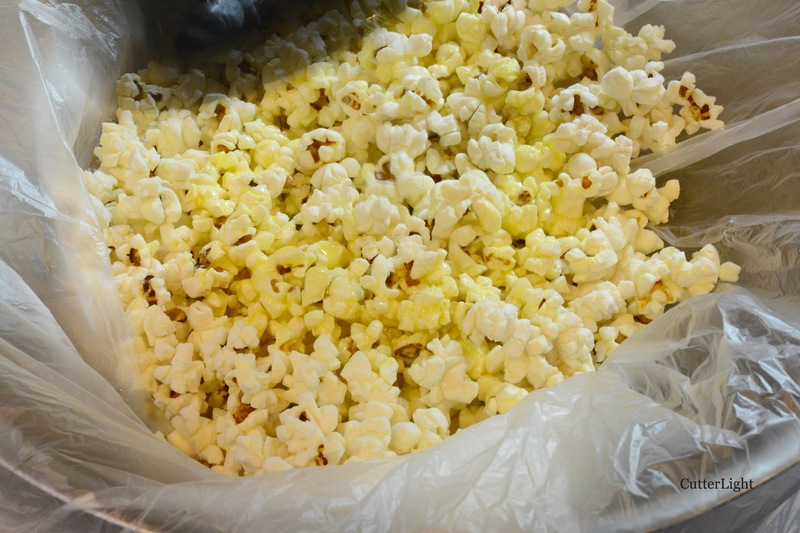 Place the popcorn in a plastic bag. Drizzle on the butter. The butter should be liquid, but not hot. Otherwise it might melt through the bag. Close the bag and shake vigorously to evenly distribute the butter. Add the herb & spice mix and salt to taste. Close the bag and shake again. 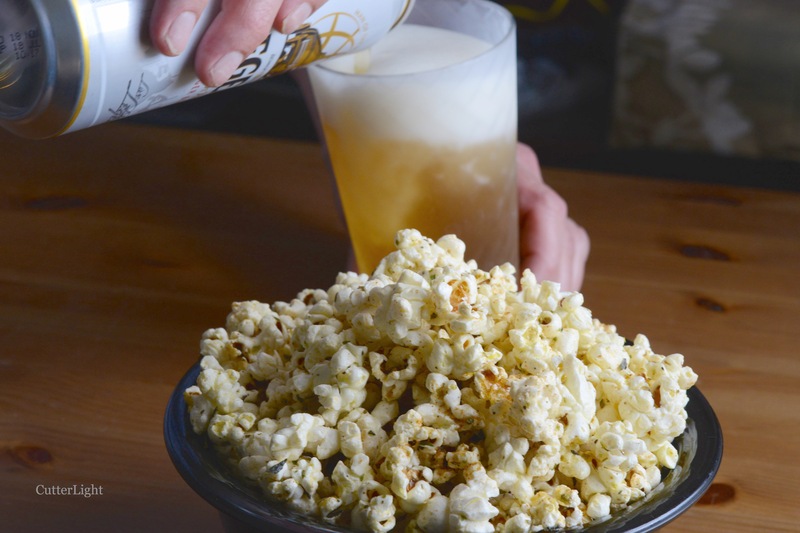 Pour the seasoned popcorn into a serving bowl. Get the glasses from the freezer. 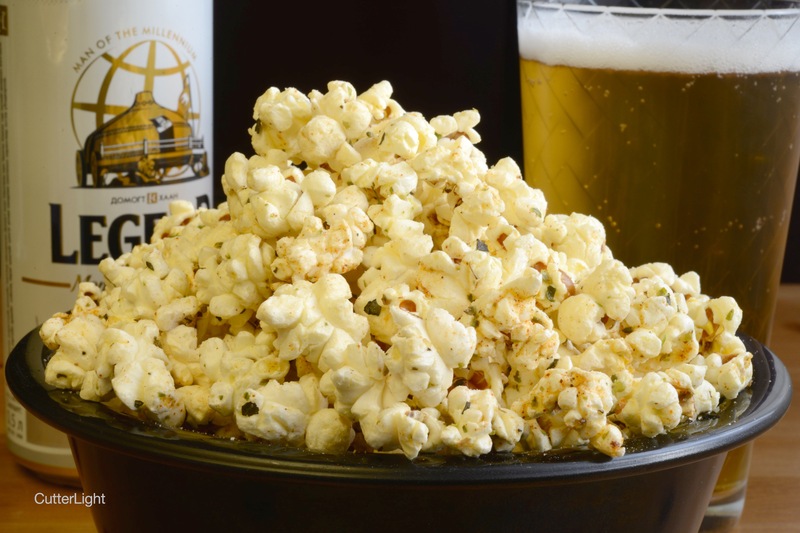 Fill with a beverage that will compliment this savory popcorn. We recommend a favorite lager. And dinner and a movie is served! 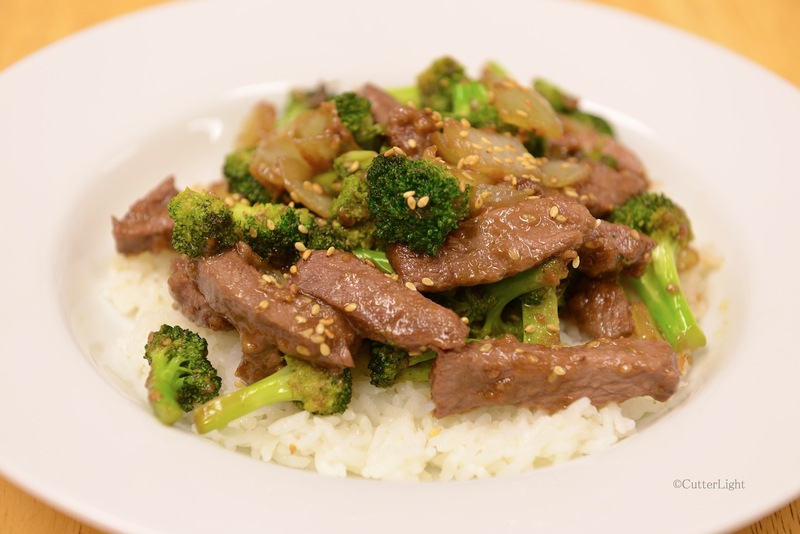 Tasty, quick, easy and attractive, beef (or wild game) and broccoli is a dish almost nobody doesn’t like. Here’s our twist on a classic favorite. More than half-way through our year in the Arctic, our freezers remain abundantly stocked with Alaskan seafood and wild game. Featured in this dish is a lean, tender cut of Sitka black-tailed deer. Asian-style stir fry such as this is perfect for days when you want something quick but delicious. Most recipes for this dish call for corn starch. For a cleaner taste and presentation while still achieving the thick broth desired for this dish, try substituting rice flour for the corn starch. A generous drizzle of sesame oil toward the end of cooking really brings this dish together. As we live far from a well-stocked grocer, we used powdered seasonings. In a bowl, combine venison strips, 1 tbsp rice flour, water, olive oil, garlic and ginger. Mix thoroughly so that each meat strip is thoroughly coated with mixture. Set aside. In a small bowl, whisk together soy sauce and brown sugar. Set aside. In a wok or large skillet, heat olive oil over medium-high heat. When oil is hot, add venison, stirring continuously for about 2 – 3 minutes to sear and lightly cook through. Remove venison to a bowl and set aside. Add a little more oil to the pan and add the onions. Stirring frequently, cook until onions just begin turning translucent but are still fairly crunchy. Add broccoli and continue stir frying till broccoli begins to turn bright green, adding a little more oil if necessary. Add venison, sesame oil, sesame seeds and brown sugar and soy sauce mixture, stirring quickly to thoroughly mix ingredients together. Cook just long enough to reheat venison. Serve immediately on a bed of steaming rice. Deep Fried Parsnips – World’s Best Bar Snack? Crispy, salty, sweet, sprinkled with a little parmesan cheese and dusted with a couple of grinds of pepper, on a fry-crazy evening, we served these classic bar snacks along with deep-friend fish & chips. No one had to be scolded to eat their vegetables! Bill Briwa, chef-instructor at the Culinary Institute of America at Greystone, calls deep fried parsnips “The World’s Best Bar Snack.” After frying up a batch, we think he’s got a good case! We used a vegetable peeler to achieve the very thin ribbons of parsnips desired for this dish. In his instructional materials accompanying The Everyday Gourmet: Rediscovering the Lost Art of Cooking, (produced by The Great Courses) Chef Briwa employs a mandolin. A little care and a very sharp knife could achieve the same effect. The key is to cut the parsnips thin. The other secret to ensuring that these snacks come out right every time is to make sure your oil isn’t too hot. It doesn’t matter whether you use canola, light olive oil, peanut oil or another oil suitable for deep frying, but don’t allow the temperature to climb above 300 degrees F. Parsnips have a lot of sugar; they’ll burn before they become tender at higher temperatures. This makes them a logical appetizer to cook up with a meal of fish & chips. As the oil heats up to 300 degrees F, place the parsnips in. The temperature will drop a little at first, and that’s OK. It only takes a couple of minutes for them to become golden brown and crisp. When they’re done, turn them out onto paper towels to drain off the oil and sprinkle a little salt over them. They’d be good served just like this, but to create a snack people can’t get enough of, add a little parmesan cheese. You can warm up a bowl in a countertop oven, place the drained, salted parsnip chips in the warm bowl, and gently toss them with grated parmesan, letting the warmth soften the cheese so it better adheres to the chips. 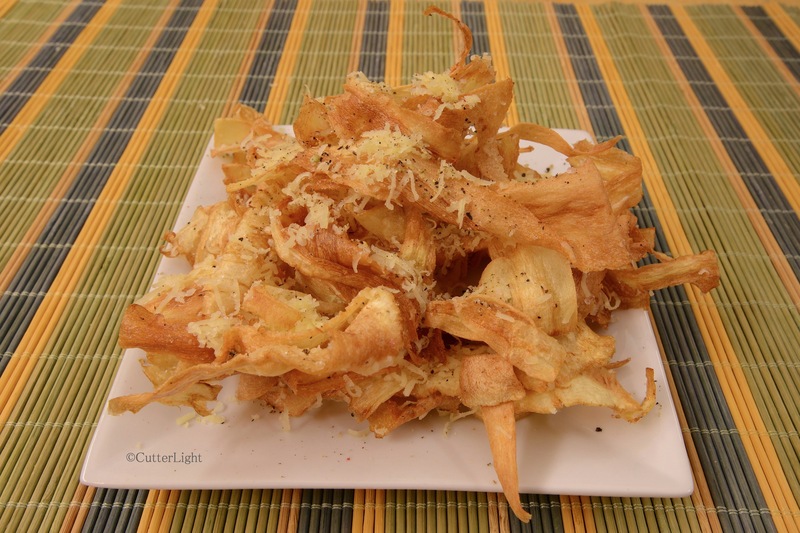 The final step is to turn the parsnips out onto serving plates in a nice, tall haystack. Hit it with a couple of grinds of pepper and serve. The cold beers should already be poured! Ladle out a bowl, mug or thermos of hot, hearty stew to fuel up for wintertime activities or for just enjoying a movie by a cozy fire. 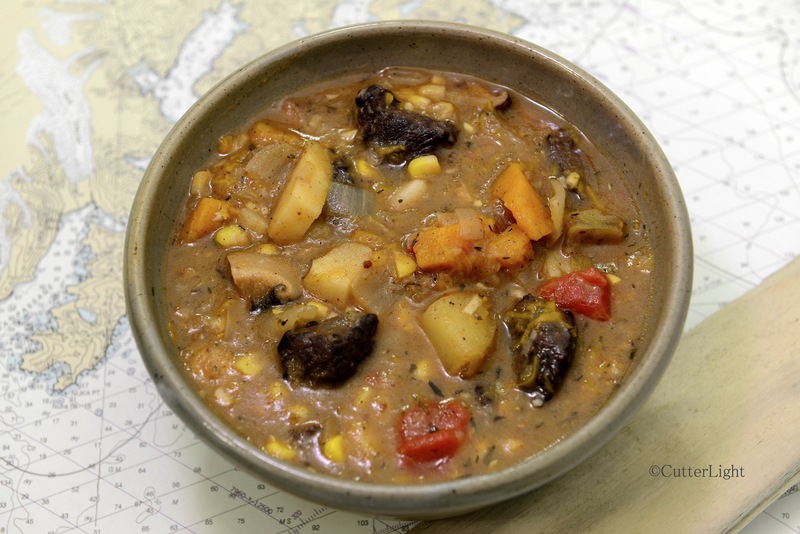 If you’ve never made a stew, or if you haven’t cooked one up in a while, the heart of winter is the perfect time. We’ve been using this basic recipe for years, varying the ingredients with what we have on hand. Different iterations have featured beef tri-tip, moose, elk, caribou, and even bowhead whale. Sweet potatoes, other potatoes, brussels sprouts, corn, tomatoes and other vegetables feature nicely. A favorite of ours is parsnips, which add a distinctive flavor that goes well with beef and wild game. 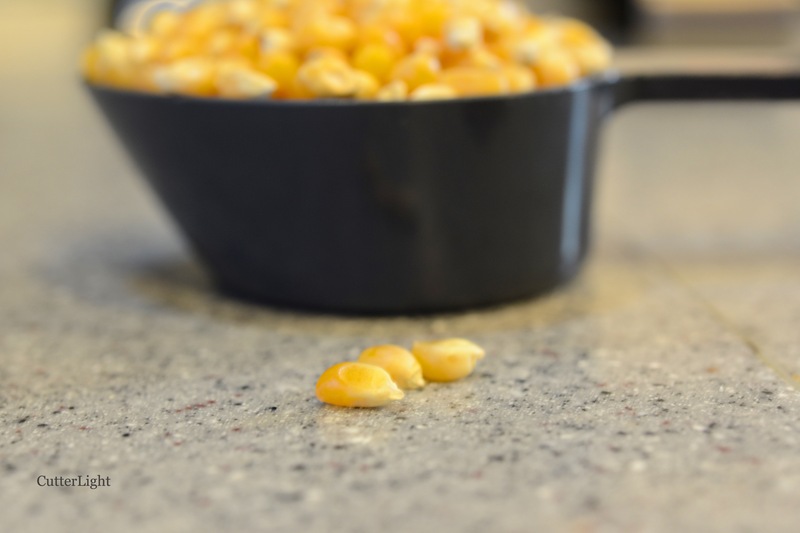 While corn starch or all purpose flour are traditional thickeners in stews – and perfectly fine – we use rice flour. It dissolves easily, is virtually without flavor and thickens without becoming pasty. Rather than provide specific amounts of ingredients for this delicious meal, we recommend taking a loose approach. A volume ratio of about three to one vegetables (combined) to meat works well, but there’s no need to measure or to be overly exact. lean, boneless meat such as chuck steak, tri-tip, or a similar cut from wild game. Cut into cubes or chunks. beef bouillon (or vegetable bouillon, or water) – enough to just cover all ingredients when combined. We use Better than Bouillon. In a large bowl, add meat, olive oil, salt and pepper. Mix thoroughly. In a heavy skillet, heat oil over medium-high heat. When skillet is hot enough to make the meat sizzle, add it, stirring and turning to sear meat. Reduce temperature and continue cooking meat through, about 6 minutes. Add onion and additional oil, if necessary. Add a splash or two of sherry or red wine (optional). Stir until onions become barely translucent but are still crunchy. Stir in garlic and cook for about 30 seconds. Stir in seasonings and add bouillon mixture or water. Add potatoes and any other slow-cooking vegetables such as sweet potatoes, pumpkin, etc. Simmer for 20 minutes. Stir in rice flour – a little at a time to prevent clumping – to achieve desired thickness. Start by adding a total of 1 tbsp, wait a few minutes as broth thickens, and continue adding to desired thickness. Add additional vegetables, adding corn last as it doesn’t need much cooking time. Simmer till vegetables are tender, tasting and adjusting seasonings as necessary. Alternatively: Place vegetables, (except corn) in individual bowls – each to its own bowl. Mix thoroughly with olive oil, salt and pepper. Keeping vegetables separate according to their kind, place them all on a heavy, oiled baking sheet and roast them at 400 degrees F, checking and removing each type of vegetable as it is done and setting them all aside in a large bowl. This ensures that all vegetables are cooked to the right consistency, and the roasting brings out sweetness. Cook meat as above, set aside with the oil it cooked in, and then add all ingredients to a large pot to finish cooking. Add the corn last. Vegetables can be grilled in this fashion too. It’s a little more effort, but it makes a difference. The sweet secret to this gallette is a generous layer of homemade cloudberry jam beneath the pears No cloudberries? Try raspberry, blackberry or apricot jam. A gallette is a beautiful dessert that can whipped up on short notice – a perfect answer to a seasonal abundance of fresh fruit. During the summer, we made a delicious strawberry-port gallette with sliced almonds in the galley of our sailboat. Since it is wintertime, we decided to make the gallette a bit more full-bodied by adding wheat flour and some cornmeal to the crust. 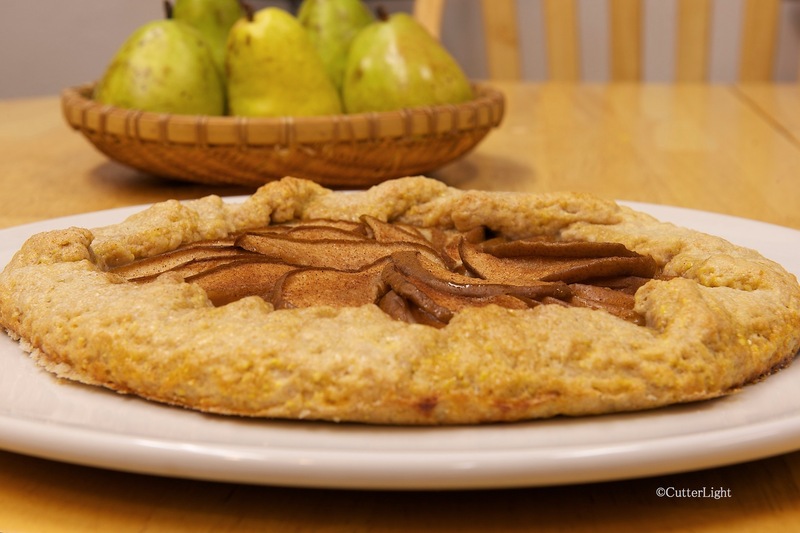 We happened to have pears on hand, but many other fruits readily lend themselves to this recipe. Enjoy a slice of pear gallette with a side salad, a favorite cheese and a freshly brewed cup of tea for a satisfying lunch in any season. Mix together flours, sugar, cornmeal and salt in a medium bowl. Using a pastry blender, mix in cold butter. Continue mixing until cold butter is the size of peas. Slowly mix in buttermilk. 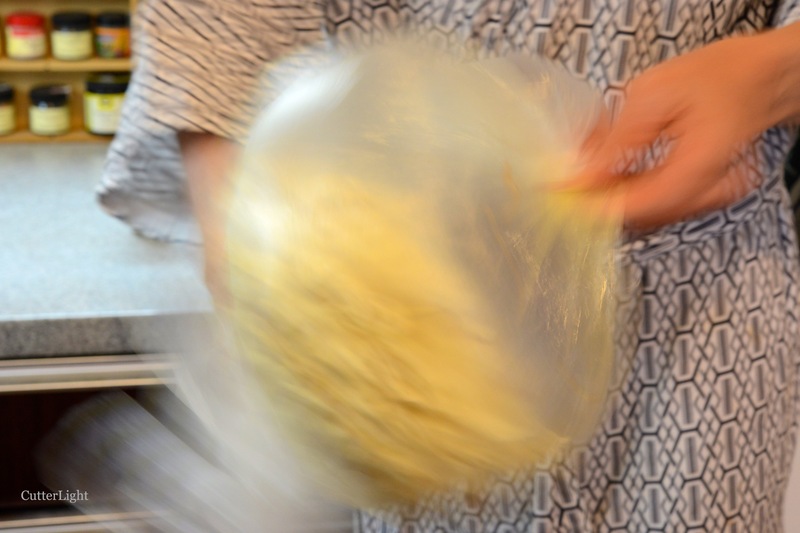 Stir with rubber spatula until dough forms into a ball. 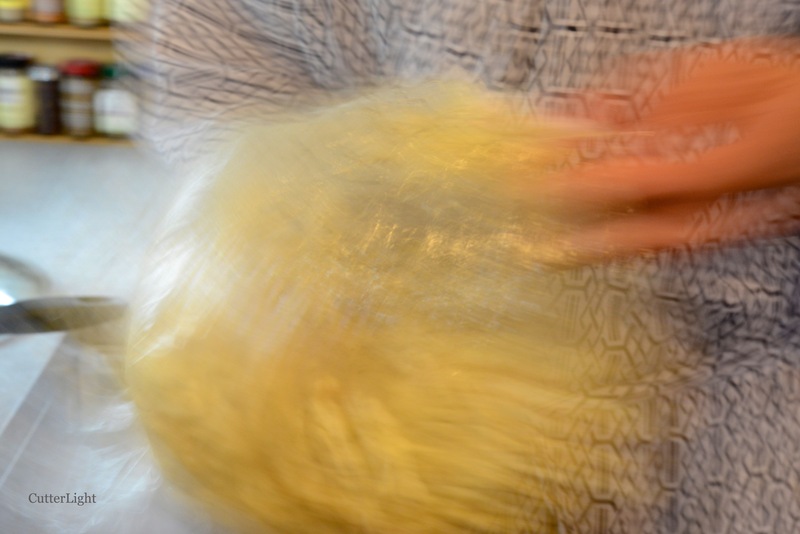 Wrap dough in plastic and chill for about 30-45 minutes in refrigerator. Cut a piece of parchment paper to fit the size of a baking sheet. Place chilled dough on center of parchment paper. Roll dough to about a 15-inch circle. This is a rustic dessert, so no need to be a perfectionist here. Brush the entire rolled dough with jam. Arrange pear slices atop dough, leaving a 2-inch border. Fold border over pears, pressing down any folds of dough. Sprinkle dough and pears with sugar and cinnamon mixture. Bake gallette 40 – 45 minutes, until dough is golden brown and pears are soft.